While we were away this past weekend, Miikka went to stay at Dog Camp with junior counselors Percy and Jessie. 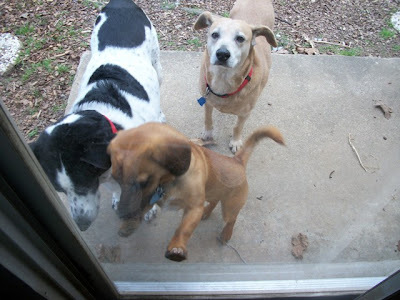 He fit right in as part of the pack, joining in all the games and generally getting in the way. Percy allowed senior counselor Betty and Miikka to share the couch, occasionally. 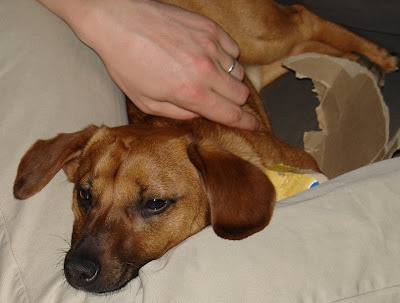 And he learned a few bad habits from Percy and Jessie, and has generally been a bit barkier since he came home, if that is possible. Now he is back to being an only dog, and he seems to enjoy that too. He has let me hold him quite a bit, and he has, for the most part, behaved himself. 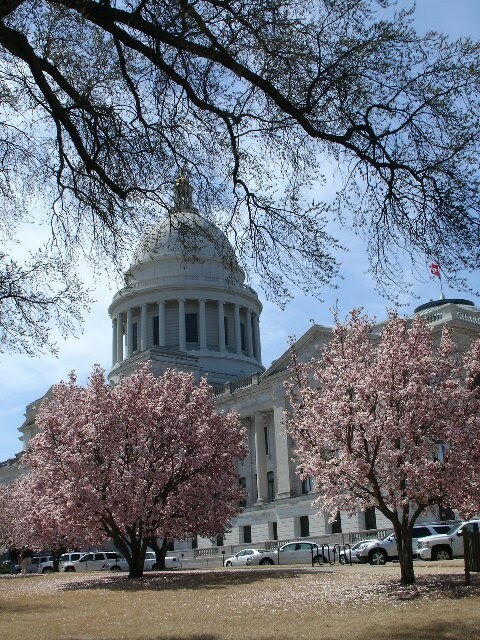 One of the lovely things about spring is the way the blooms sort of sneak up on you. 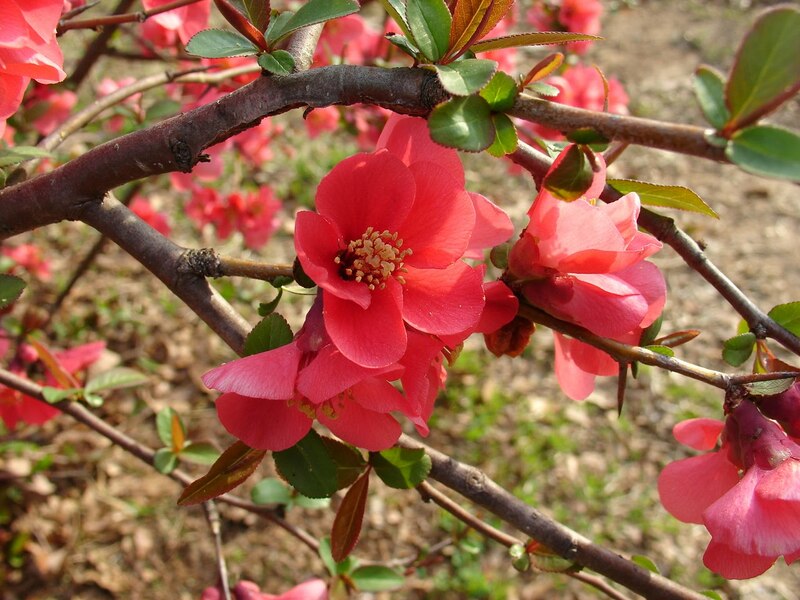 I mean, a week before, there was nothing but brown sticks, or bare earth, then *boom* you have quince blossoms and daffodils. 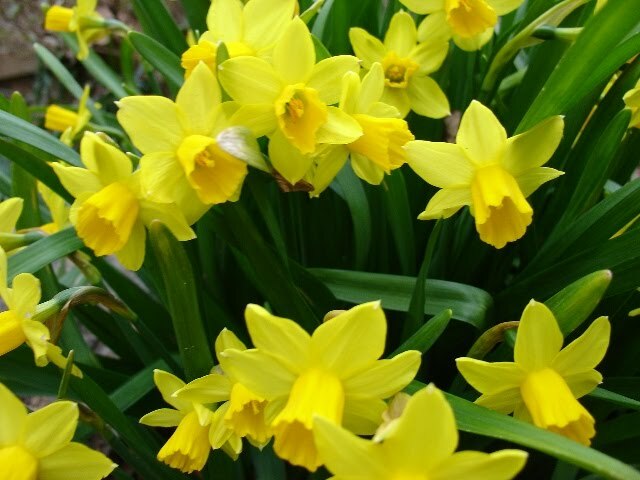 The surprise is even great for us this year, since it is our first spring in our new house. 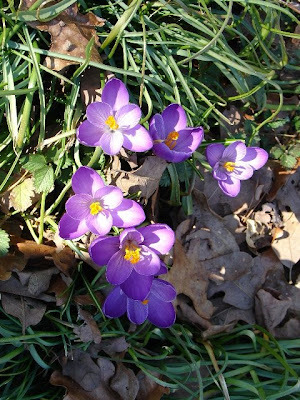 We don't know what-all was planted for spring, and it has been fun discovering the miniature daffodils and the crocus. But best of all, I discovered yesterday that we have a LILAC BUSH! One of my great sorrows in Texas was that lilacs just don't grow there - it is too hot in the summer and not cold enough in the winter. But lilacs, at least certain varieties, do grow in Arkansas. I have been planning to plant one, maybe for next year, and now I don't have to. It turns out that a rather undistinguished looking bush on the side of our house is actually a lilac. It isn't blooming yet, but there are buds. I can't wait! Spring moves fast too - this picture is from a couple of weeks ago, and by now, these trees have leaves and the flowers are gone. I am sure the grass is turning green as well. We went away for the weekend, and when we came back, a clematis that I had hacked down to the ground a month ago (well, it was all dead and brown, and I was putting a rose next to it) had resprouted and is already almost a foot tall. More surprises await, I am sure. I am still feeling a bit under the weather - this cold will not let go! 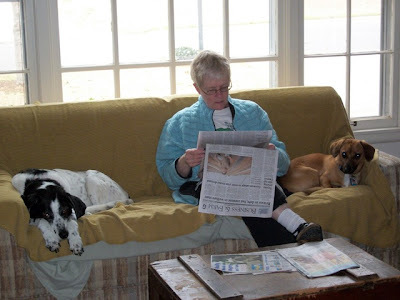 - so I am a little behind in everything, including blogging. So, to tide you over a couple more days, here are two pictures from the last week. 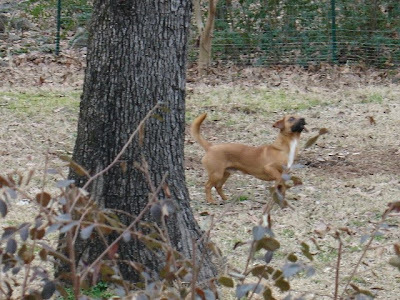 The squirrels really enjoy our yard, when Miikka is inside. 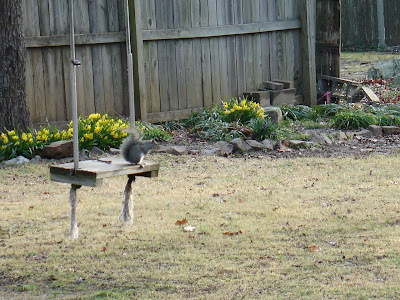 This one was probably just about to raid the bird feeders, again. Apart from sending the dog outside, which scares the birds, or getting a BB gun (my dad's choice), there isn't too much we can do about them. Oh well. The birds still get a good amount of the seed. The dirt for our garden arrived on Monday, and Benjamin spent portions of the last two days moving it from the driveway to the backyard. This is about halfway through the process. We have enough left after filling this bed that we might buy or make another planter. Maybe something just for potatoes? It is really nice dirt, and Miikka was enjoying playing king of the mountain on it. 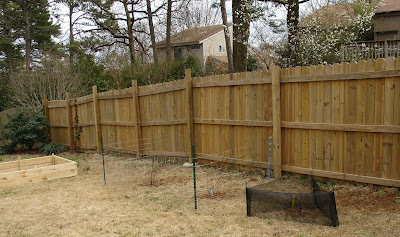 Not for long, bucko - as soon as we get ready to plant, the fence is going up! One of our garden activities this past weekend was building a raised bed for our vegetable garden. 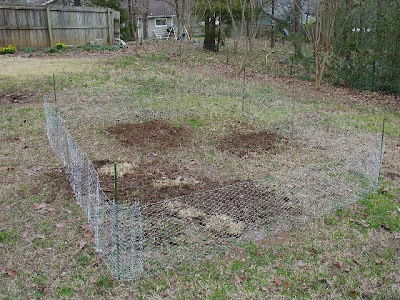 The soil in our yard alternates between rocky with a bit of dirt, to clay with lots of rocks, so the idea of carving out a proper vegetable garden was daunting, to say the least. 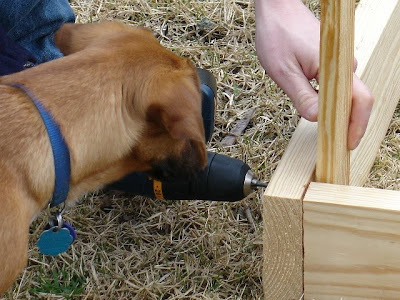 Miikka closely supervises the drilling. To spare ourselves that pain, we decided to build a raised bed for some of the vegetables, and use pots on the deck for the rest. 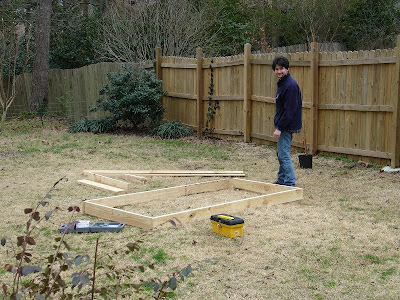 Following plans he found online, Benjamin constructed a lovely 8' x 4' box, 12 inches deep. 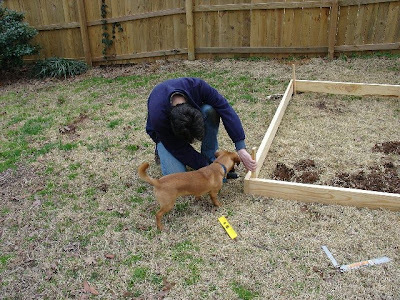 As he does with any outdoor project, Miikka had to be closely involved with the building process, which was better than him being involved in my blueberry planting, which was going on at the same time. And, voila! 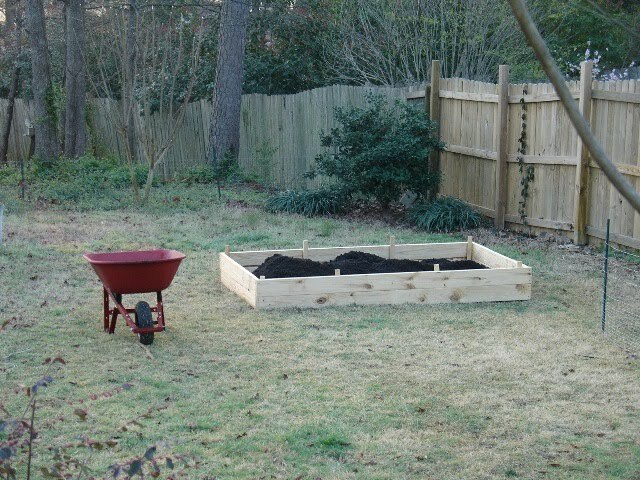 A lovely raised bed, needing only to be filled with soil before it will be ready to host lettuce, carrots, beans, and tomatoes. Although this weekend wasn't quite as nice as last weekend, we were still able to get out in the yard and do some work. First up on the task list: protecting my roses. They have been under attack since last weekend, when they were first planted. This one has been dug up and dragged out to the lawn at least 3 times, despite the thick thorns on the stems. 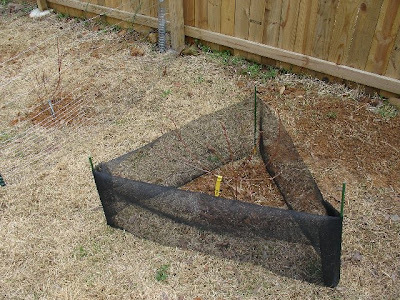 We also planted the blueberries and put up protective fencing around them as well. The disturbed dirt around them makes them both irresistible, and incredibly easy to dig up. 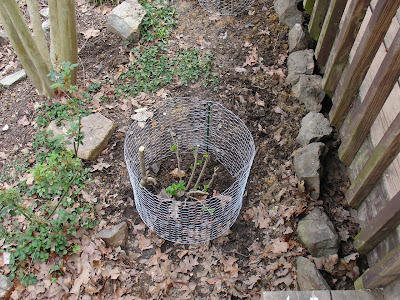 To avoid a repeat of the rose incidents, we waited to plant the blueberries until we could adequately protect them. So, until they are established and look like real plants, instead of just twigs ripe for chewing, they are contained in cages. In addition, in an attempt to rehabilitate the canal system/open pit mine that our lawn has become, a section of it is walled off as well. Some of the sod from the blueberry holes has been transplanted there, in the hopes that it will take root and spread. Once this area looks better (if it ever does) the cage will be moved to the next bare spot needing help. I will also be putting down some grass seed, or other ground cover, when I get back to the garden store. (We made one big trip this weekend, but I was unwilling to go back until later). And the cause of all this fencing? You're looking at him - Trouble Puppy Miikka. So cute, and so destructive. Sigh. Here are some Miikka pictures for your Friday enjoyment. 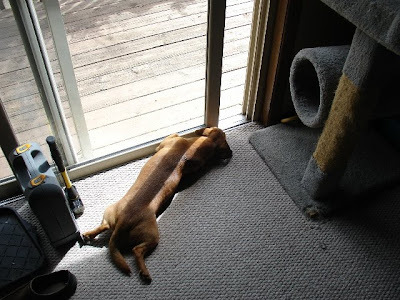 Miikka in repose, having destroyed a cardboard cracker box (one of his favorite activities), and Miikka in action, trying to figure out how a squirrel eluded him (they all do). 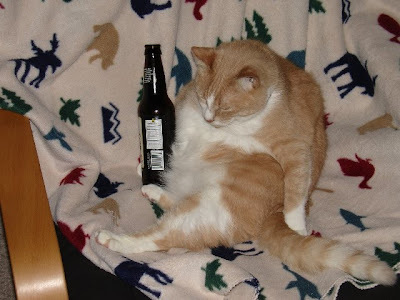 That's it from me for the week. Enjoy your weekend. 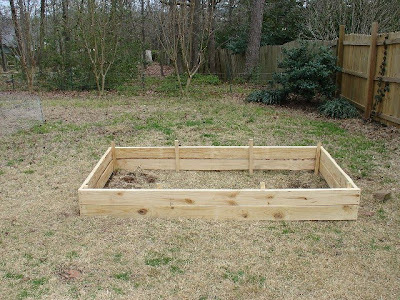 The weather is supposed to be decent here, and if Benjamin and I can rally enough energy from our cold-stricken states, we might get started on our raised beds for our vegetable garden. But then again, we might just loll around the house, blowing our noses and moaning. We made gyoza by hand this weekend, and it was good. Gyoza are small dumplings, filled with a mixture of vegetables and meat (or tofu, I suppose, although I would rather just have vegetables at that point). 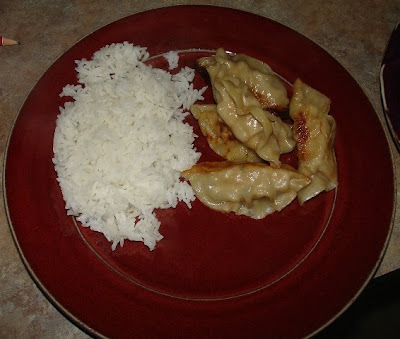 I love to order gyoza when we go out to an Asian restaurant, but I also love to eat them at home. Because I don't really like buying frozen meals, I don't buy them at the grocery store, which severely limits my access. Now, though, I have made them and know I can make them any time (well, any time I have an hour to fill all the dumplings and then another 30 minutes to cook them...). I used a recipe I found here*, and modified the process just a bit. Instead of hand chopping the vegetables I used my Cuisinart to chop all the vegetables and to mix the pork in, and since I know my own limits, I used store-bought won ton wrappers instead of making them from scratch. It took a while to fill all the wrappers, and the filling did use an entire package of wrappers, but with Benjamin doing the cooking part, everything went pretty smoothly. They were so yummy, and we have plenty in the freezer for my next snack attack. The weather must have been listening to last week's whine, because we had lovely weather for the rest of the week and into the weekend. Miikka got several walks in the park, since it was too nice to just walk the neighborhood. I spent hours in the backyard, cleaning up leaves and ripping out ivy. Why would anyone voluntarily plant ivy? It is a horrible menace, climbing my oak tree, squeezing itself between the boards of my fence, and infiltrating my flower bed. (OK, that flower bed isn't really "mine" yet, apart from general land ownership, since I haven't planted anything in it, and have generally ignored it since we moved in, but it will be mine one day!) Anyway, I ripped out as much ivy as I could, with some "help" from Miikka. I even got the first spider bite of 2010! Wahoo. The flowers that a previous owner planted have started blooming. 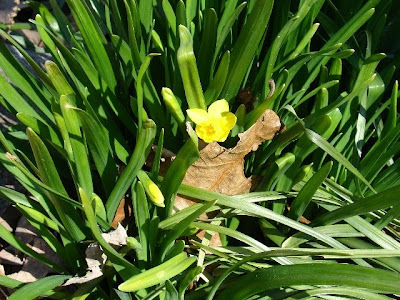 I took these pictures on Saturday afternoon, when this was one of only a few miniature daffodils out; by Monday afternoon, the plants were awash in yellow and the crocus plants were starting to fade out. I also took the first steps towards putting my own imprint on other areas of the yard. When we moved in, there was a clematis blooming on the end of our deck. Now, I don't have anything against clematis, and it was an interesting one, but to be honest, I prefer roses. I want my flowers to have a scent. So, we ventured out to White Wagon Farm and bought three new rose bushes, including a climber to go in place of the clematis (which I had trimmed down the week before - it may still come back, which would be fine, but it may not...). 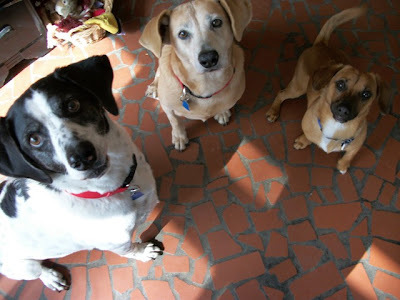 We also bought three blueberry bushes, which, if we can keep safe from squirrels, birds and Miikka, should provide us with some wonderful fruit. 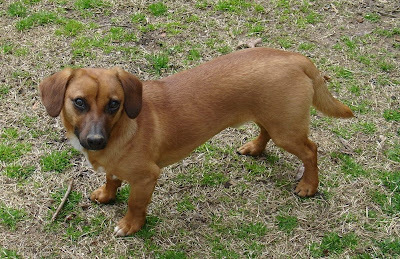 Miikka is indeed going to be a problem in our garden plans; as soon as I got done planting the roses, he started trying to dig them out again. Even the thorns on the rugosa rose didn't dissuade him. And he loves vegetables, so I have no doubt he will try to eat them, given the chance (once they are actually planted that is. next weekend, hopefully). We are going to have to install some chicken wire fences, I am afraid. Ah well, at least we have a garden in which to have these problems. See this, Spring? 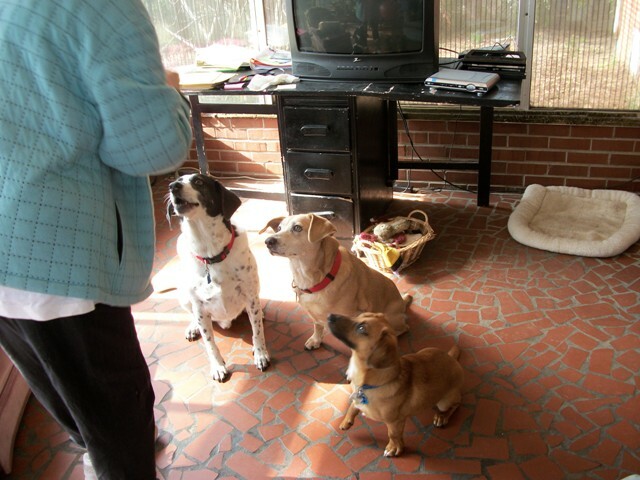 Can we have some now? Please? OK. It is March, enough with the cold weather, the gray skies, and the brown grass. I am ready for Spring! Ready to plant my garden and watch sprouts grow. Ready to have daffodils, tulips, and anything else blooming that I can. 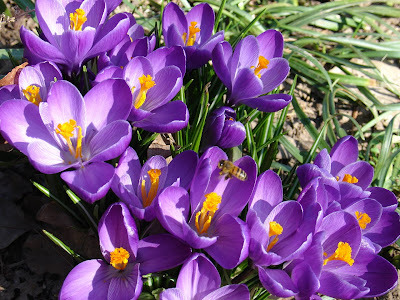 We just had a lovely weekend, with sun and almost warm temperatures, which we enjoyed enormously. We took a hike with the dog, and I got out to do yard work both Saturday and Sunday. Yesterday and today, however, have returned to winter. 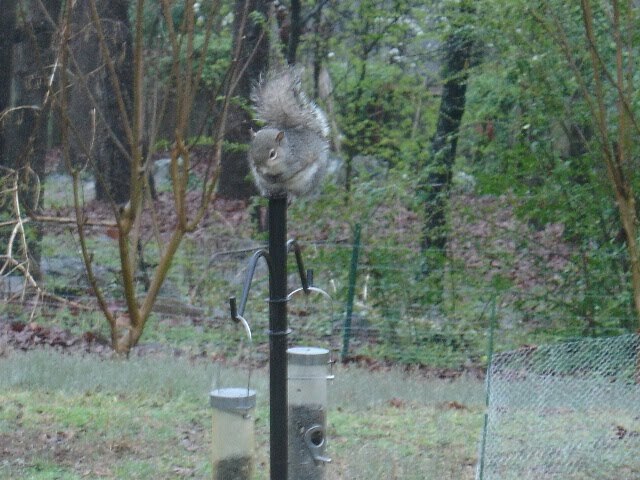 It is cold, it is gray, and I have had enough. Please, spring. Please.